Elijah Alexander and Allison Jean White in Ayad Akhta’s “Disgraced,” the year’s best drama here. 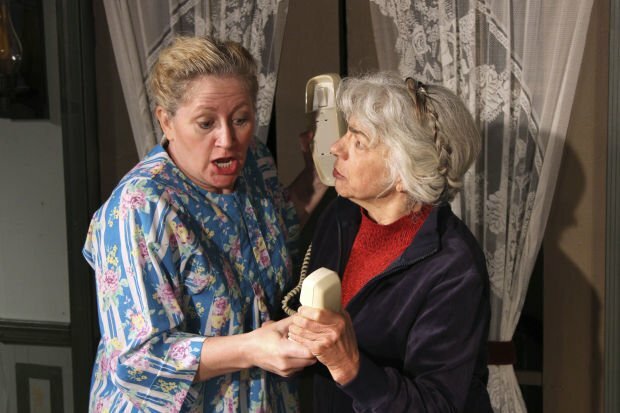 Rhonda Hallquist, left, and Carlisle Ellis in a divine night of comedy as sisters in Live Theatre Workshop’s production of “The Savannah Disputation,” the Mac winner for comedy. Lucille Petty shined in the difficult role of Joan of Arc in Winding Road Theatre Ensemble’s production of “Saint Joan.” She takes the Mac for best actress. Matthew Bowdren as Hamlet is your Mac Award winner for best actor. A gritty and brave “Cabaret,” staged by the Arizona Repertory Theatre, was the year’s best musical. Borderlands Theater’s production of Milta Ortiz’s “Más” is about the dismantling of TUSD’s Mexican American Studies program. Director Marc David Pinate wins the Mac. Little escaped Tucson stages this year. There was tragedy and comedy, laughter and tears, love and hate, life and death. There was also provocative theater, and just plain silly theater. Theater that left us with questions, and theater that provided some answers. While almost all the performances seen this year touched us in some way, there are ones we can’t let go of. It is those that we present with our Mac Awards. The awards, now in their 15th year, are named after Mary MacMurtie, who spent much of the last century turning Tucson children into actors, directors, stage technicians and audiences who appreciate heart, honesty, intent and excellence. The Rogue Theatre’s sparse “Hamlet” was riveting and thrilling. We sometimes think “Waiting for Godot” is a tragedy. Then a comedy. Then tragedy again. Whatever you classify it, The Rogue Theatre’s production of the Samuel Beckett play teased us and thrilled us. Borderlands Theater’s production of Milta Ortiz’s docudrama “Más,” about the dismantling of Tucson Unified School District’s Mexican American Studies program, captured the soul of the movement and the efforts to save the program. ATC’s “The Five Presidents” is as much comedy as it is drama. The Rick Cleveland play was packed with charm and cattiness, tenderness and turmoil. The Mac goes to Arizona Theatre Company’s “Disgraced.” The Ayad Akhta play was not only timely, it was provocative and poetic. And this production did what the best theater does: made us question our beliefs and assumptions. Arizona Onstage Productions gave us two shows that kept us humming and grinning: “The Great American Trailer Park Christmas Musical” was a celebration of bad taste, and “The World Goes ‘Round: The Songs of Kander and Ebb,” oozed good voices, good music and good times. Arizona Repertory Theatre’s “A Little Night Music” is a challenging play for college students — Stephen Sondheim’s music is complex — but the University of Arizona actors made it look easy. “Snapshots” isn’t a strong script, but the ATC production sure was. The Mac goes to Arizona Repertory’s “Cabaret,” which was gritty, powerful and brave. “Cabaret” might be considered a shoo-in for the Mac — who doesn’t love it? But this production gave us new shades of the Kander and Ebb piece, and drew surprisingly sophisticated performances from the student cast. Invisible Theatre’s “Shear Madness” was so outlandish, but so much fun. Live Theatre Workshop’s production of “Laughter on the 23rd Floor” reminded us why we love Neil Simon plays so much — they rock with laughter. Invisible Theatre’s production of “Tru” showed us a Truman Capote who was smart, self-destructive and very funny. The Rogue’s “Rosencrantz and Guildenstern Are Dead” was given all the wit and weight the Tom Stoppard play deserves. “The Savannah Disputation,” Evan Smith’s play about two Southern sisters who have differing views about the evangelist who knocks on their door, tackled the subject of religion with reams of laughter. The Live Theatre production kept us in stitches, and takes the Mac for best comedy. Patty Gallagher’s turn as Portia in The Rogue’s “Merchant of Venice” was often transcendent. Shanna Brock had to hold the stage all by her lonesome in Live Theatre’s “Bad Dates.” She impressed with her saucy, exuberant character. Kathryn Kellner Brown was majestic and heartbreaking in her role of Gertrude in The Rogue’s “Hamlet.” The agony and sometimes-clueless side of Hamlet’s mother were palpable in her hands. Lucille Petty captured the innocence and religious fervor of Joan of Arc in Winding Road Theatre Ensemble’s solid production of “Saint Joan.” It was a difficult role, and she shined in it. She takes the Mac for best actress. Christopher Younggren’s philandering husband in LTW’s “Move Over Mrs. Markham” was perfectly underplayed. David Morden’s buffoonish Polonius in The Rogue’s “Hamlet” provided some much needed laughter. Charlie Hall’s foolishly optimistic Herr Schultz in AZ Rep’s “Cabaret” was soul-wrenching. But it is Matthew Bowdren’s performance as Hamlet in the Rogue production that we can’t shake. He was haunting and haunted, tender and consumed with revenge. His Hamlet made us see the Shakespeare play with fresh eyes. He takes the Mac. Kevin Johnson directed a focused and crisp “The World Goes ’Round: The Songs of Kander and Ebb” for Arizona Onstage. And Danny Gurwin pulled impressive performances from the UA student actors and brought a freshness to his powerful production of Arizona Rep’s “Cabaret.” He wins the Mac for best direction of a musical. Cynthia Meier’s fast-moving “Hamlet” caressed the language and made the complex story clear. Sabian Trout’s direction of Live Theatre’s “Savannah Disputation” transformed us to the Southern home of a couple of off-key sisters. The Mac goes to Marc David Pinate’s direction of Borderlands “Mas.” It was steeped in culture, woven with mysticism, and infused with clarity.